On Nov.6th, the signing ceremony of educational exchange and cooperation agreement between Jinggangshan University and Taiwan Aletheia University was held. Vice-president Xiao Changchun of Jinggangshan University and Lin Wenchang, president of Aletheia University signed the agreement on behalf of respective universities. Vice-president Zeng Jianping was present at the ceremony and delivered a speech. Xiao introduced the basic situation of Jinggangshan University, including the development of international cooperation and exchange, cooperation with universities in Hongkong, Macao and Taiwan. 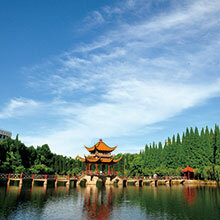 Lin briefly introduced Aletheia University. 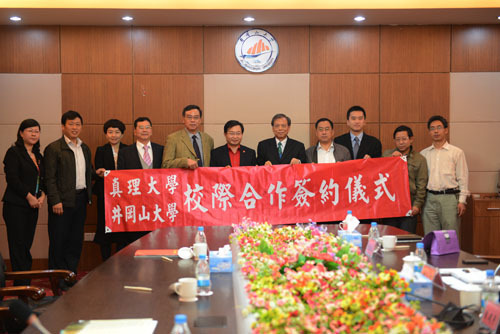 Leaders of Tourism and Sports knowledge Faculty and International Affairs Center of Taiwan Aletheia University, and leaders from the relevant departments and schools of Jinggangshan University also attended the ceremony. Later the two sides discussed about the cooperation details. 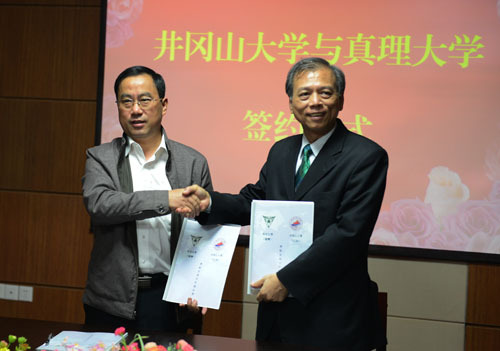 According to the agreement, in the following five years, the two universities will join their hands in promoting academic and cultural exchange, and conduct extensive cooperation in student short-term study, student exchange, joint education of undergraduate, faculty exchange and other academic activities.